There’s no place like Shedd Aquarium for the holidays. Guests are invited to explore and connect with animals, create magical memories, and keep an eye out for Santa, who will be making an appearance at Shedd throughout the holiday season. 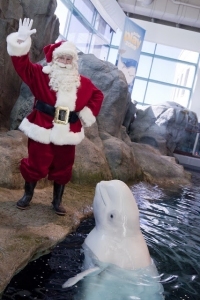 It’s the most wonderful time of the year… Shedd’s holiday breakfast! Join us for breakfast and hot chocolate, a screening of Rudolph the Red-Nosed Reindeer and The Polar Express 4-D Experiences and a meet-and-greet with Santa. Afterward, you can explore Shedd’s children’s exhibit, Polar Play Zone, and finish your special day with reserved seats to the aquatic presentation, One World. It’s that time of year when you want to find the perfect gift for the holidays – the same goes at Shedd Aquarium. If you’re looking to make a splash this holiday with the perfect gift for friends and family, Shedd has a sleigh full of holiday shopping ideas – whether it’s making your tree come to life with colorful aquatic ornaments or by purchasing an annual membership to enjoy Shedd year round, or even a family trip with Shedd Adventures. Information: Generosity is a cornerstone of the holiday season for many, and a perfect opportunity to impact real change at Shedd. Our members have been invaluable in making Shedd Aquarium a world‐class animal care leader, vital learning resource, scientific community contributor and global conservation champion. 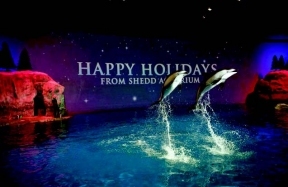 To get involved, and receive your year-end tax credit, you can give today at www.sheddaquarium.org/donate.